Ariela saw this film at Tribeca when it was called GEEZER at a special screening that featured a post screening musical performance by Billie Joe Armstrong. Here is her report of that screening- minus the stills from the concert. 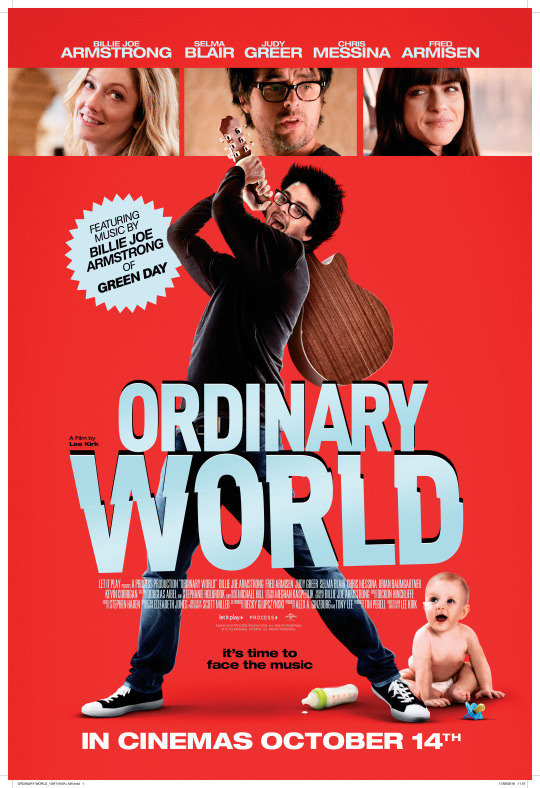 Ordinary World is the story of a man who was once a punk rock singer and is now a husband and father of two. His 40th birthday is approaching and he has a midlife crisis of sorts. He's conflicted between wanting to party and wanting to be responsible. He rents an expensive hotel room but at the same time, his in laws are in town and his daughter has a talent show. Will he stay and party or will he be responsible? This was a fun film and I definitely enjoyed it. It's not a super deep film but it's worth seeing. Billie Joe Armstrong plays the lead and does a great job! I wonder if the film was inspired by his life at all since I know he's a dad and isn't performing much these days. After the film Billie Joe took the stage, with drummer Tre Cool (Mike wasn't able to make it) performed. They played 2 songs from the film (Billie Joe wrote new music for the movie), then played one and a half Green Day songs. Joan Jett came out (she had a cameo in the film) and played Bad Reputation. It was a lot of fun!